A letterpress is more than just a piece of machinery. 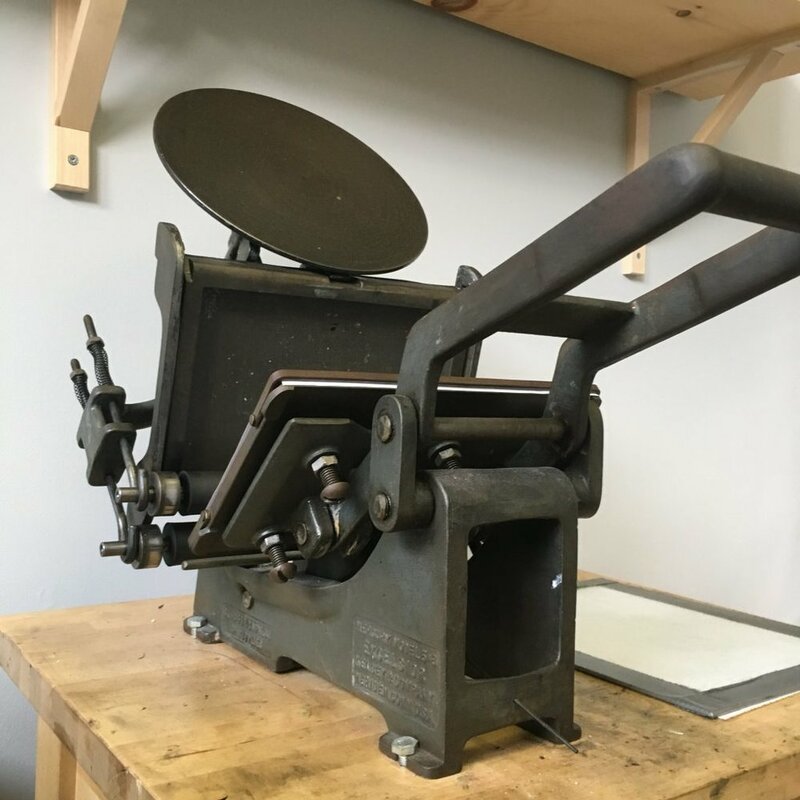 Our workhorse is our 8×12 Shniedewend & Lee Gordon oldstyle press. Manufactured in Chicago sometime between 1884 and 1893, this press is based on a design by George Phineas Gordon. He produced the “Franklin” press–so named because he claimed that Benjamin Franklin had revealed the basic design of the press to him in a dream. His press was strong, well built, and easy to operate. It was such a great press that several companies copied his design. This was the case until 1901 when Chandler & Price, of Cleveland Ohio, purchased Gordon’s plans and the rights to the “Gordon” name. Shniedewend & Lee survived the Chicago Fire and eventually became Challenge Machinery, which is still in business today. This press came to us in 2016 by way of the Cranky Pressman of Salem, Ohio. Pretty Girl was our first press. She was designed by William A. Kelsey, who began marketing his presses in 1872 before he knew whether or not he had designed an operable machine. It turned out that he had not. It wasn’t until 1875 that he introduced his first self inking press, the Kelsey Excelsior, which was manufactured with only minor changes for more than 100 years. 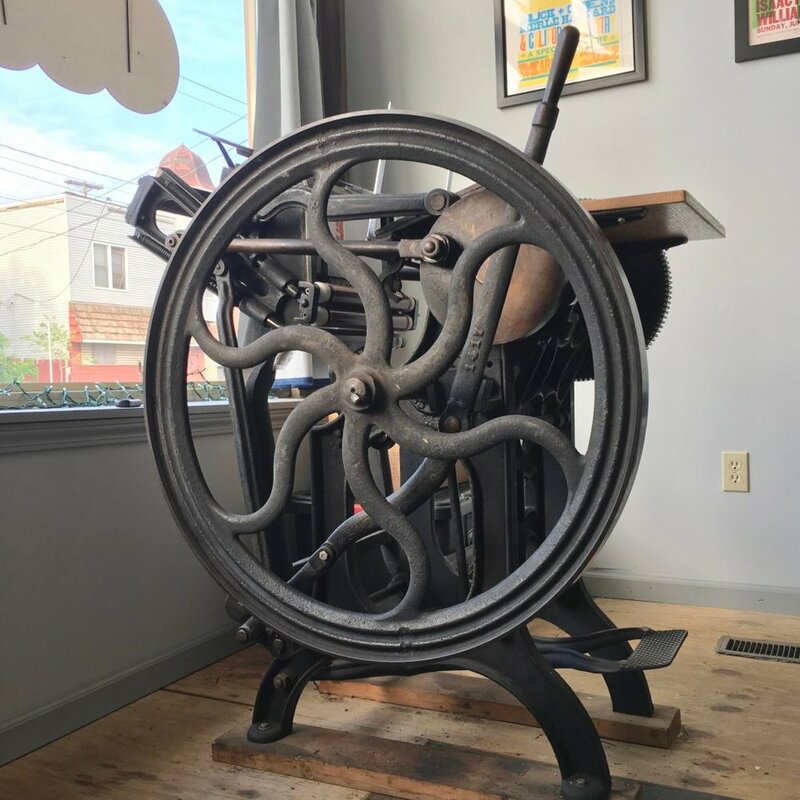 The press was marketed to amateur print makers, and–for many who would go into the trade–the Kelsey Excelsior was most printers’ introduction to letterpress. Our version, a Model P, was rescued from a barn in Sanger, Texas. Its arrival marked the beginning of Triple Threat Press. For a time Pretty Girl was the only press in our arsenal. After weeks of disassembly and rust removal, she printed our first greeting cards in September of 2012. For some jobs, traditional, handset type might be appropriate. We have a small but growing font collection of type that is available for your project.